Cologne’s medieval heritage is one of the West’s most splendid and influential, but most Western Civ classes and books leave it out. 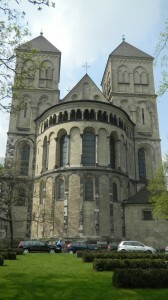 Its Romanesque and Gothic buildings were some of the highlights of a 4 month trip I took through Northern Europe in 2010. 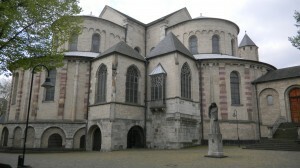 The stately Romanesque jewel above is St. Kunibert’s church. It’s the northernmost Romanesque church in Cologne. It’s on the Rhine, and the facade you see above faces the river. So people who sailed into this busy commercial hub immediately saw these ordered forms. They stated that Cologne is a city of law-abiding Christian merchants. 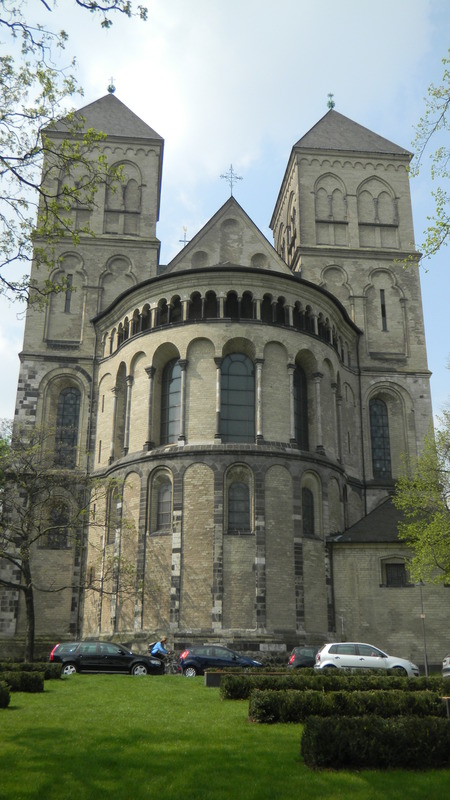 This facade also hinted at other gems in one of Northern Europe’s most spectacular medieval cities. The church you see above is St. Maria im Kapitol. It had been a women’s convent since the early 8th century, and the building you see was built in the 11th century. 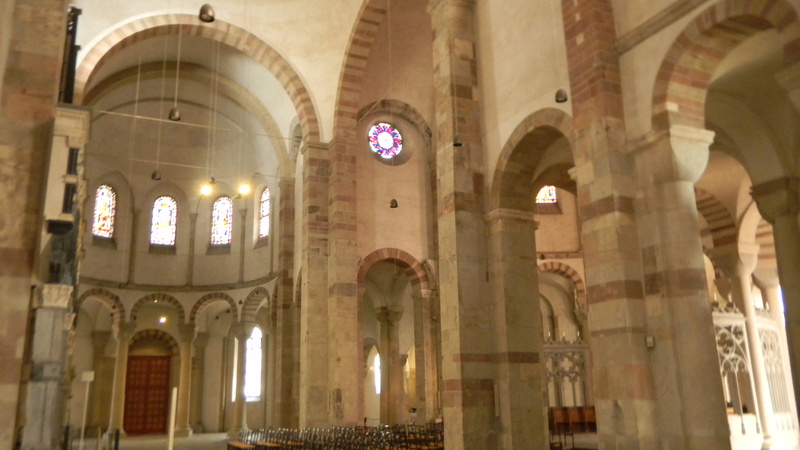 It’s one of my all-time fave Romanesque churches. I found its clover-leaf choir most moving. 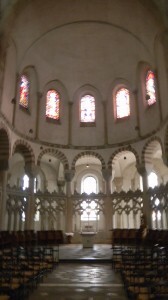 You can see the top part of the clover on the left side–the semi-circular apse, which is at the opposite end of the entrance. On the right side is one of the two semicircular wings. I took the above photo within the wing on the opposite side. So you’re looking at the inside of the wing that you see in the prior picture. 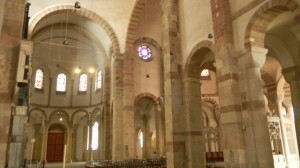 The apse flowers on the right side. 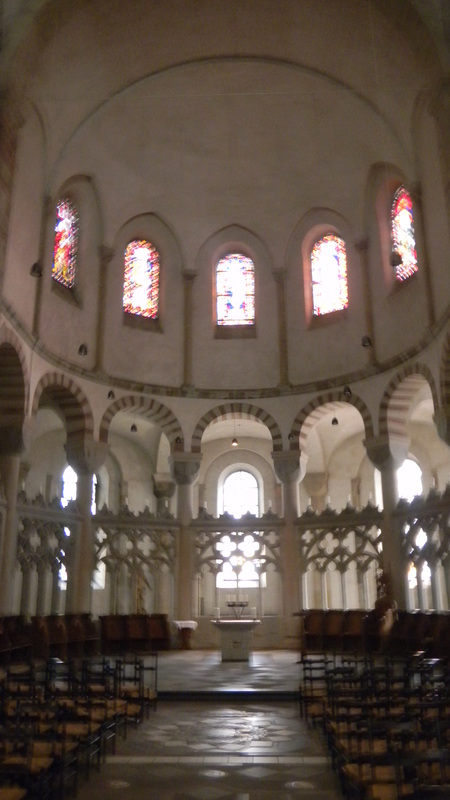 And above, you can view the apse–Romanesque perfection. The builders of this church modeled the clover-leaf design on the one in the Church of the Nativity in Bethlehem. As 11th century Europe was growing economically, more people made pilgrimages to The Holy Land. This design impressed them. When they returned home, they used it as a model for universal order–simple, proportioned, stately and graceful. This idea of the world being unified through simple static geometric forms was common in ancient Greece. Europe used it again as it emerged as one of the world’s great civilizations in the Middle Ages. It’s a different ideal than the yin-yang flows in the Shanghai World Financial Center. But linger inside and you’ll be entranced by one of the West’s greatest expressions of the marriage of static geometrical proportion and sacredness.